While streaming services like Apple Music and digital downloads from storefronts like iTunes rule the music industry, listener appreciation for analog vinyl audio remains high, as evidenced by new holiday sales data released by retailer Amazon. Touting its success this Christmas shopping season, Amazon revealed on Monday that its top selling home audio product this year was the Jensen JTA-230 3-Speed Stereo Turntable with Built-in Speakers. 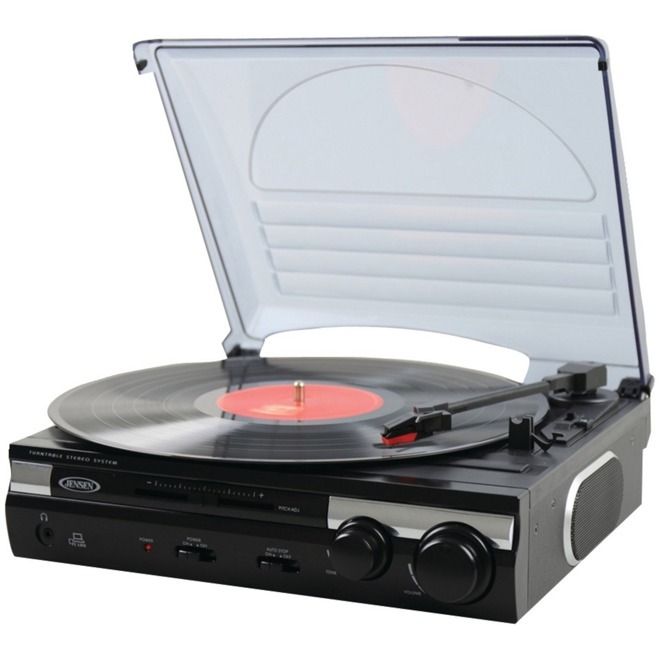 While it features a USB port for converting vinyl records to digital, and features an auxiliary input for connecting a digital media player, the No. 1 bestseller is decidedly old school, playing 33, 45 and 78 RPM records with a belt-driven three-speed stereo turntable. The Jensen turntable outsold Amazon's second-hottest home audio product of the fall of 2015, the Yamaha RX-V677 7.2-channel Wi-Fi Network AV Receiver. Notably, the Yamaha receiver features built-in support for Apple's wireless AirPlay protocol, allowing users to transmit music from an iPhone, iPad, iPod touch, Mac or Windows PC. Amazon's third-most-popular home audio product this season was the Sonos Play:1, a 2-room streaming music starter set. The Sonos product also has an Apple connection: Earlier this month, Sonos added beta support for the Apple Music subscription streaming service. Despite the continued popularity and even recent gains for vinyl music sales, streaming and digital downloads remain far and away the most popular way to consume music. In fact, streaming music revenues in the U.S. eclipsed CD sales earlier this year, highlighting the importance of the debut of Apple Music this summer. As of last year, physical music sales— including CDs, vinyl, and casettes —still claimed 32 percent of the overall market. Vinyl sales have increased year over year for the past nine consecutive years, and 2014 was the best year for vinyl since 1991, when Nielsen SoundScan first began tracking music sales. As for the rest of Amazon's holiday sales announcements, the company continued its usual vague proclamations, revealing only that Amazon Prime subscriptions and device sales achieved "record-setting" levels. Exact hardware sales or overall subscription numbers were not revealed, though the company did disclose that more than 3 million new Prime members joined during the third week of December, presumably to ensure Christmas gifts were delivered on time. Amazon took the same approach earlier this month to boast about Black Friday sales without delving into specifics. At the time, Amazon said its Fire TV was the best selling streaming media player in the U.S., but the data only applied to a period of time prior to the launch of the new fourth-generation Apple TV.